Five years ago on May 7, 2002-- the Supreme Court passed a set of landmark orders for the protection of the Andaman and Nicobar Islands' unique ecosystem. Besides the fragile ecology of the islands, the orders were also meant to protect its tribal communities, which are slowly being pushed to the brink. 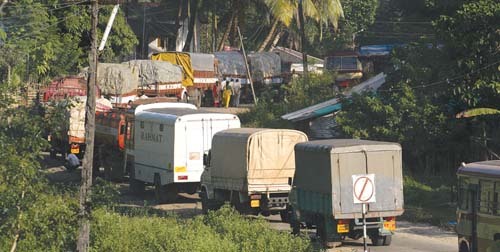 The orders included, among others, a direction to stop all timber exports from the islands' tropical forests, restrictions on sand mining on the islands' beaches, the creation of an inner-line regime to regulate the influx of people into the islands from the mainland, shutting down of the Andaman and Nicobar Forest Plantation and Development Corporation, which had illegally logged forests set aside for the tribal communities, and the closure of the Andaman Trunk Road (atr) that runs through the heart of the forests of the Jarawas--one of the tribal groups native to the islands.Impunity Much traffic has moved down this road since then and the message that comes across loud and clear from the islands is that no one really cares if the Supreme Court orders are implemented. Since the order, the islands have had four chief secretaries, three lieutenant-governors and two members of parliament, and each of them has shown that Supreme Court orders are not for him to implement. There have also been many entreaties on behalf of the islanders in these five years many petitions have been sent to New Delhi and Port Blair. Various committees of the government--including the Supreme Court's Central Empowered Committee (cec), another expert committee created by the Calcutta High Court and most recently, one that was formed by the National Advisory Council, with Jairam Ramesh and Syeda Hameed as co-chairs--have pointed out that the islands' administration continues to violate orders of the Supreme Court. The response of the local administration? Continued indifference. atr continues to be open, bringing in a huge set of disastrous influences on the Jarawas. Kiss of death When construction of atr began in the late 1960, Jarawas had opposed it violently. It is alleged that in retaliation, camps of construction workers were fortified with high voltage wires and many Jarawas were electrocuted. As work on the road progressed, more of the Jarawa's forests became accessible for settlements, agricultural fields and horticultural plantations. It brought in people from the outside and took out thousands of cubic metres of tropical evergreen forests, forests that the Jarawa needed for survival. For the Jarawa, the road only brought the kiss of death. The small community has been hit by an epidemic of measles twice in the last seven years. The first, in 1999, affected roughly 60 per cent of their total population of 300-odd individuals. The second epidemic happened about a year ago when a significant portion of the population had to be hospitalised. There are innumerable examples of forest-dwelling communities from around the world that have been annihilated by diseases like measles, which might be common in the outside world. The Jarawas could be the latest on that long list. Disease is just one of the miseries that atr brings. The others include alien food, intoxicants and, reportedly, even sexual exploitation. 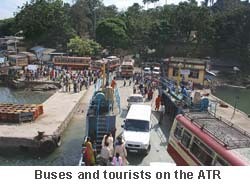 atr has also facilitated the rise of a pernicious endeavour, perversely called 'Jarawa Tourism'. Tourists visiting the islands are being openly solicited with offers of rides along atr and the promise of seeing stone-age tribes. It is often argued that atr is the sign of the islands' development and that the political and economic costs of closing it will be too high. It cannot also be denied that thousands of settlers, who use the road today, will be inconvenienced. What we have in the balance therefore is the inconvenience of a few thousands against the very survival of the small Jarawa community, which incidentally has been here for about 50,000 years and should have the first right on the resources and the forests. It should not be a difficult choice to make. There is expert opinion from within India (see box Expert rejection) and from around the globe that has argued for the closure of the road. This includes the views of researchers, anthropologists, other indigenous communities and various activist organisations. The latest addition to the list is a un report. The un Committee on the Elimination of Racial Discrimination says in its report "[India] should protect tribes such as the Jarawa against encroachments on their lands and resources by settlers, poachers, private companies or other third parties, and implement the 2002 order of the Indian Supreme Court to close the sections of the Andaman Trunk Road that run through the Jarawa reserve." The most persuasive argument in favour of closing atr is encapsulated in an official note written in 2003 by R K Bhattacharya, former director of the Anthropological Survey of India. "The atr," Bhattacharya argued, "is like a public thoroughfare through one's private courtyard... In the whole of human history the dominant group for their own advantage has always won over the minorities, not always paying attention to ethics. Closing it would perhaps be the first gesture of goodwill from the dominant group towards a group on the verge of extinction." The issues are various and intensely debated. But is anyone in the administration listening? The writer is author of Troubled Islands Writings on the indigenous peoples and environment of Andaman and Nicobar Islands.